Social media marketing provides an enormous opportunity for businesses across industries to target customers where they exist online. Facebook and Instagram are two fantastic platforms that offer companies and enthusiastic entrepreneurs avenues to advertise that can be extremely effective. Did you know that Facebook has more than 2 billion active monthly users? The most popular global social media site must not be ignored. (Defy it at your peril!) Instagram is widely-used around the world too, boasting a cool 800 million unique monthly users. Implementing a comprehensive advertising program that includes both of these platforms gives you access to potential customers across demographics and beyond borders. The accuracy of FB ads is pretty incredible. Compared to other online ads at approximately 38%, FB garners around 89 percent accuracy! 89 percent! Targeting a specific audience vastly improves the effectiveness of your advertising. During the course of a month, over 120 million Instagrammers contact businesses after viewing an ad on the platform. There are a number of areas you can tackle to target your ads on these social media giants. With the availability of big data and analytics in the digital realm, you can utilize many types of information to make your advertising initiatives as precise and powerful as possible. The possibilities with location include more than just a potential customer’s geographic location of residence (refined by country, state, and postal code), it can also include where the person works. Did you know that you can target ads for a certain square-mile area radius around major cities? This option is not in all countries, but it is important to consider this type of advertising if it is available. Location can also include targeting of people who have recently visited a location (locally or otherwise) or those who are planning to visit a location in the future. Behaviors encompass a range of activities as diverse as an artist’s color palette. The information for this often comes from comments on posts, post likes, shares, and other activity online and off. Human behavior is often habitual, but not always. Behavior data can be the result of weekly outings or irregular special events and cross many paths of our lives. Purchases are at the top of the list when it comes to valuable consumer behavior data. You can direct your ads for buying habits in all kinds of categories including technology, pet and kids’ products, household products, home and garden, food and beverage, sports, clothing, and more. The types of mobile devices used are also listed under this category. Smartphone or tablet brand and type, the kind of network, and whether the device is a new owner can all be calculated in the equation within your targeted advertising. Online activities such as gaming, web browsers, OS, and primary email domain can all be useful too. Other behaviors that may be utilized include volunteer work and donations, media habits, financial interests, seasonal events (ex: sports, fashion, etc. ), and even in a B2B capacity such as company size or industry interaction. An abundance of insight can be gained with the information that people place on their profiles. Gender, age, generation, languages, and education-level are often available. But it goes much beyond that. Certain companies can utilize information from relationship status such as single, engaged, domestic partnership, married, divorced, etc. Sometimes, you can find out not just the existing relationship status, but also the desired future status and who they prefer to be with. Work-life is another demographic that can be very helpful to businesses. Do you sell a specialized product or piece of equipment for a certain industry? From manufacturing to hospitality, using this information is critical to your targeted marketing campaigns on Facebook and Instagram. Politics is another biggie. No surprise in this day and age! Targeting your ads to where potential customers fall on the spectrum is something that media outlets and companies with politically-associated products like clothing can take advantage of (proceed with caution!) Another powerful P-word in the world of demographics is parenting status. Do your potential customers have toddlers or teenagers? Do they have kids that are involved in a particular sport? If you have a soccer mom in your sights or an elementary school child that loves STEM activities, targeting these specific demographics on Facebook and Instagram can help you speed up the achievement of your business goals. Discovering the interests of your target audience opens up additional opportunities on Facebook and Instagram. These can include anything from hobbies to entertainment. With the information in likes, shares, comments, and posts, your potential customers will showcase the types of things they really care about such as reading literature, going to indie rock concerts, social justice, woodworking, and health and wellness. The advertising strategy around interests can also be applied on a seasonal basis. Sports fans are an excellent example of this. From football to basketball and more, targeted ads during their official seasons will offer an increased chance to score a sale. Powerful audience selection tools are at your fingertips. Facebook and Instagram will help you creatively connect with dazzling specificity — allowing a personalization that fits your marketing campaign and business goals. Facebook offers comprehensive audience insight data to help you compose a strategic advertising campaign that covers lifestyles, likes, demographics and more to capture the targeting options to best effect. Did you know that 80% of Instagram users follow a business account? Are you taking full advantages of the storytelling opportunities in promoting your brand and increasing sales? 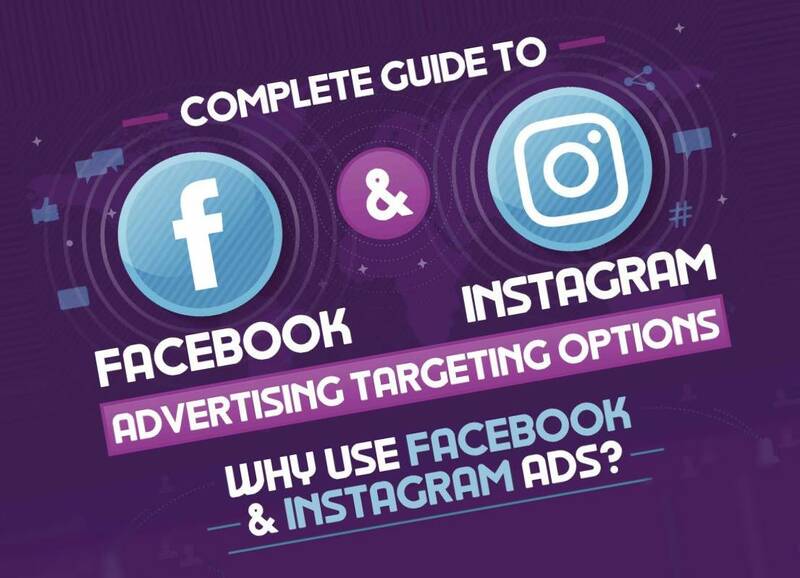 With a focused, results-oriented advertising strategy, and the best resources, Facebook and Instagram advertising campaigns have the capability to catapult your business past your top competitors.